Society’s latest temporary (there’s a new one every year) exhibit, created by yours truly and mounted last week, in my day job as a freelance museum curator. It was just fine when I arrived, in spite of my annual “everything’s fallen off the walls in the middle of the night” nightmare waking me up about five-thirty in the morning, and we had a good attendance. The introductory panel. The photo is one I took, of the golf course featured in the exhibit. The Lakes District began as a playground. As Tacoma grew, its residents began to search for an escape from the bustle and dirt of the city. The Lakes District, with its oak prairies and many lakes, and its spectacular view of nearby Mt. Tacoma, was ideal. First came the Tacoma Country and Golf Club, the first of its kind in the West. A streetcar spur was built, creating easy access to it and to summer homes on many of the lakes, including American Lake, which later began hosting crew races. The bustle of Tacoma came to Lakewood with the roaring of the racecars at the Tacoma Speedway. The Lakewood Ice Arena enabled many a figure skating champion. modern sport in Lakewood today. Here’s a sampling of the rest of the exhibit, in case you live too far away to see it in person. If you’re not, however, the exhibit will be up for an indefinite time (months at the least — the date for the next exhibit opening hasn’t been set yet). The Tacoma Country and Golf Club panel, and three photos of important figures in the club’s history. Tacoma to build the first golf course in the U.S. west of the Mississippi. They imported clubs and balls from Scotland, the customs inspector mistakenly labeling them as agricultural implements, saving the club some cash. In 1904, the golfers partnered with the existing Tacoma Country Club, buying property along American Lake in what is now Lakewood, expanding the club’s offerings and selling building lots, at the newly-renamed Tacoma Country and Golf Club’s permanent home. In spite of many setbacks – among other things, two club houses were lost to fire – the club prospered, hosting six national tournaments over the years. Most recently, the golf course won a renovation of the year award. Sporting a new vintage feel, the course is now ready for another 120 years. The first display case, with a historical golf ball plaque and ball, and a golf ball signed by Jordan Spieth, who won the Masters this year, and who is distantly related to one of our board members. The other display case, with a pair of hockey skates used at the ice arena, and several programs from the Ice Capers performances held there. The lower righthand photo in this grouping is of a car called the Great Big Baked Potato Special, which raced several times at the Tacoma Speedway. The gentleman above it is Eddie Rickenbacker, WWI hero and race car driver, and immediately to his left is the first women’s race at the Speedway, held in 1916. Below it is the last race ever held at the Speedway, in 1922. The ice arena panel, and several photos. In 1936, due to his wife Mary’s interest in figure skating, Norton Clapp purchased the Oakes Ballroom on the shores of Lake Steilacoom to turn it into an ice arena. Private at first, then open to the public, the arena became the home of the Lakewood Winter Club. Despite its drawbacks, including its non-regulation size and lack of a Zamboni, pro instructors John Johnsen, George and Leah Mueller, and Kathy Casey produced many nationally-known figure skaters including two-time Olympian Jimmy Grogan, two-time U.S. Sr. Men’s Champion Scott Davis, Women’s Jr. World Champion Jill Sawyer, and U.S. Pairs Champions Judi and Jerry Fotheringill. The club also put on an annual performance called the Ice Capers. Ice hockey and curling competitions took place here as well. But by the mid-1970s, the arena’s condition had deteriorated to where it was no longer safe to skate there, and in 1982, its roof and one wall collapsed into Lake Steilacoom. The Lakewood Ice Arena was no more. But thanks to Mary Clapp and the Lakewood Winter Club, ice sports are still alive and well in Pierce County. The Fort Steilacoom Park panel, one of the timeline panels, and several photos. The background of the big panel was created from a photo I took of one of the barns at the park. First, the land was part of Fort Steilacoom, the oldest fort on Puget Sound. Then it was part of the Washington Insane Asylum, now Western State Hospital, and used as a farm to help provide the inmates with food and useful labor, and as a space for a cemetery, which the group Grave Concerns maintains and improves to this day. In 1970, the state of Washington leased 350 acres of the land to Pierce County for a park. The county built two rough ballfields, also used for growing hay, but made few other improvements. 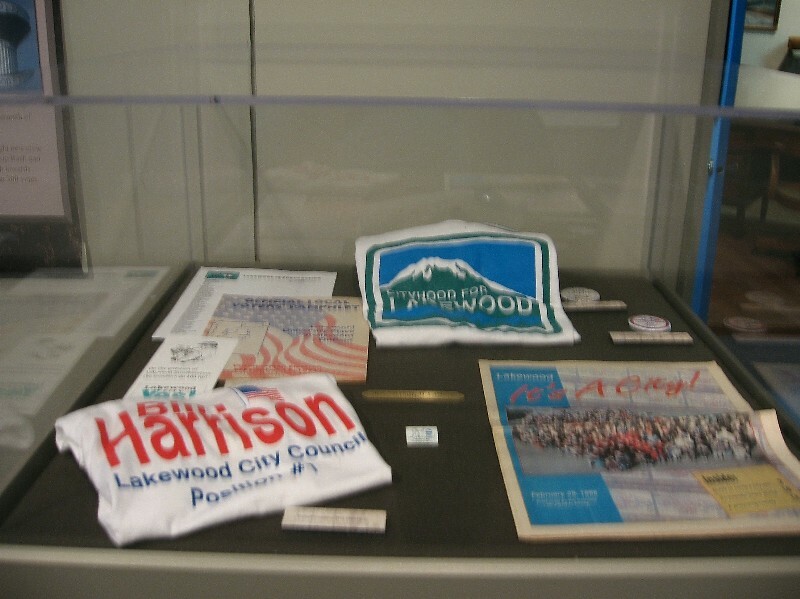 In 1996, the city of Lakewood was incorporated, and city government took an interest. A collaboration was formed. More playing fields were created and the existing ones improved. Walking trails were added, as well as a dog park and disc golf course. In 2006, the Lakewood Rotary Club and 2871 volunteers built a brand-new playground. And the Partners for Parks community group continues to raise funds to improve our grand park. The one big artifact. This is from the Lakewood Winter Club, which was headquartered at the Ice Arena. I hope you enjoyed this, and that if you can come see it in person, you will! Well, actually, to the Lakewood Historical Society’s new exhibit, which I researched, designed, created, and installed (in my other life as a freelance museum curator), about Lakewood’s long and deep connection with the military, from Fort Steilacoom in the mid-1800s, through Camp, later Fort, Lewis and McChord Air Force base, and on to what is now called Joint Base Lewis-McChord. Anyway, here are some photos of the exhibit, which I finished installing today, and which opens on Saturday. Do forgive the photography. Using a flash in the museum is not a good idea, and I obviously need to buy a tripod. The introductory panel, with two photos of the main gate at Fort Lewis, one not long after it was built during WWI, and the other as it is now. The first exhibit case, including a Civil War era forage cap from Fort Steilacoom on the right, and a WWI era hat and bugle from Camp Lewis. The panel about Fort Steilacoom and the early maneuvers in the Lakewood area. A timeline panel, a few photo panels, and the panel about Camp Lewis. Another timeline and more photos. 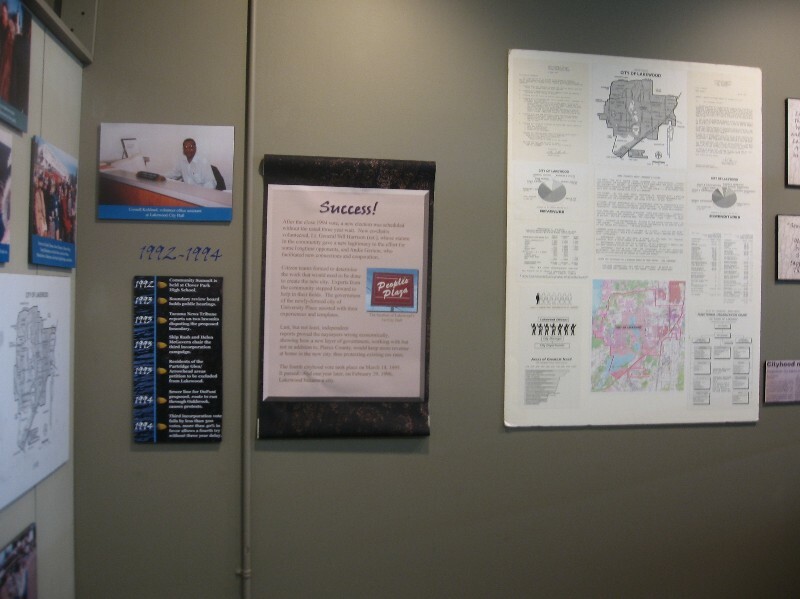 The panel in the upper lefthand corner is a reproduction of WWII-era “smileage coupons” purchased by civilians, given to soldiers, who could redeem them for movie tickets, food, and other non-necessities. The other exhibit case, full of commemorative regimental coins and a plaque with a replica Stryker vehicle from Lakewood’s community connector program. Oh, and three sets of dog tags. One from WWI, one from WWII, and one from Vietnam, all from local soldiers. And more photo panels as well as the panel telling about JBLM and the community connector program, which connects local communities with specific military units as a mutual support program. If you are in the vicinity (here is the link to the Lakewood Historical Society’s website) between noon and two o’clock on Saturday afternoon, May 3rd, for the grand opening, we’d love to see you there. And if you can’t make it then, the exhibit will be open to the public until next spring — the museum’s hours are noon to four, Wednesday through Saturday. If any of you follow more writers besides me, you’ve probably seen others doing the Writing Process Blog Tour, in which different writers discuss the stories they’re working on and how they do it. They tag the writer who tagged them, and find other writers to join in. What you get out of it? Finding new writers and spreading the word! So, Angela Highland tagged me. She’s annathepiper on LiveJournal and DreamWidth. She has her own Writing Process post here on LJ and here on DW. Right now, I’m working on what I hope will become the first book in another series, set in what will later become Mt. Rainier National Park. My hero is a young man from Savannah, Georgia, who is traveling west in the summer of 1885 in hopes of a cure for his consumption (tuberculosis, very common but as yet uncurable at that time, although not always fatal in the short term), but also to escape from his smothering family. And that’s about exactly how far I am with Stephen’s story right now, except that it does have a title: Zoetrope, which is also the name of a simple 19th century gizmo for creating the illusion of moving images, which may give you a slight idea as to where I intend to go with this one. Or not. Once I finish building the museum exhibit that is consuming the rest of my life between now and May 3rd when it opens at the Lakewood Historical Society, I will also be revising my “highway patrolman crashes his cruiser out in the wilds east of the Cascade Mountains and finds himself in the local equivalent of Brigadoon” story. Brigadoon if it wasn’t silly and full of music, that is. That one’s called Sojourn. I’ve never actually run across other books in my particular sub-genre, which isn’t to say that they don’t exist. My books are fantasy, but they’re not quest fantasy or urban fantasy. Definitely not urban. Almost all of them are historical because they involve time travel and other fantastical hijinks, but they’re not in located in the usual settings for historical fantasy, even though there’s a lot of straight historical fiction, and other time travel novels for that matter, set in the Old West, but not any fantasy set in national parks that I’m aware of. Love stories are central to all of my books, but only one of them is a genre romance, and it’s contemporary. It’s also something of an aberration, because I have no other genre romances in the works. I have to admit this has made my Yellowstone trilogy-plus (the plus being the short story “Homesick“, which is available for free through my website) the marketing challenge from heck. Because I have a penchant for looking at perfectly ordinary things and thinking, “what if?” Well, okay, Grand Geyser is not ordinary in any normal sense of the term, but I don’t know of anyone else who has watched the Grand erupt in all its glory and thought, “wouldn’t that make a terrific time travel device!” A lot of my writing (like much of my own sense of identity) is inspired by a sense of place, and from learning about a place’s history. The people generally just show up and tell me that I need to take their dictation about the bizarre adventures they’ve had, which isn’t to say that they’re not important. I read for character, pretty much full stop, so I write for it, too. Lois McMaster Bujold once talked about her writing process as “writing to the next event horizon.” That’s pretty much what I do, too (imitation being the sincerest form of flattery, especially when it works). I brainstorm the plot until I’ve gotten as far as I can get, then I sit down and write up to that point, then I brainstorm till I’ve hit the next event horizon, then I write to that point, and so on and so forth till I’ve reached The End. I like to know the end point I’m aiming for early on, but that doesn’t always happen, and even when it does it often changes before I get there. The only time I actually knew the very last sentence in the book when I started was with True Gold, my Klondike Gold Rush novel and the second in my Time in Yellowstone series (yes, I managed to get Yellowstone into a Klondike Gold Rush novel – if you want to know how, read the book [g]). I won’t say what it was because it’s a spoiler, but I knew from the very beginning exactly who was going to say the last line, and what he was going to say. And he did! So, that’s how I write, and if you’re a fellow writer and you would like to be tagged, comment here and I’ll amend the post. This one’s about the Job Carr Cabin Museum and quilting in public [g]. and the new exhibit opens! The introductory panel The first large panel and one of the timelines. I designed and created all of the graphics myself this time. (the election was in 1995), so I created one. Another large vinyl panel with wood in the background. The water tower photo is one I took. The first display case. I had very few artifacts to work with. These are documents used during the cityhood campaign. The large panel is an artifact. with the people who were involved in the cityhood campaign. in the local paper,and a copy of the voter’s pamphlet. The third vinyl panel, and one of the six timelines. city colors as a stripe down the middle. were heavily weighted towards the end of the exhibit. corkboard with a supply of pushpins and index cards. of the text panels more clearly here, too. I wish I could show you more of what the exhibit was actually about, but the size of the photos makes that very difficult. I have to say that this was my very first attempt at designing graphics from scratch (the museum used a graphic designer for the first exhibit), and I’m pretty proud of them. I used InDesign, mostly, but the introductory panel was adapted from the one for the first exhibit, for continuity’s sake, and used Illustrator because that’s what my predecessor had used. The rest of it’s all me, though [g]. That a curator update might be called for, since I haven’t written one in a while. 1) A B-17 bomber pilot outfit, consisting of what made me think of nothing so much as a pair of ski bibs and jacket. Except, of course, for being made of leather lined with sheepskin and weighing what seemed like 500 pounds. 2) A pennant from the U.S.S. Arizona, dated 1924, commemorating a cruise to the Caribbean and through the Panama Canal. 3) An assortment of souvenir hankies from the Alaska-Yukon-Pacific Exposition in Seattle in 1909. 4) And today, a 1940 leather football helmet from the local high school, and the jersey that went with it — both obviously well-worn and used. The blue paint? dye? was peeling and cracking on the helmet, and the jersey was, among other things, missing a chunk at the back hem I estimate at about 5×7 inches. Or a good handful [g]. 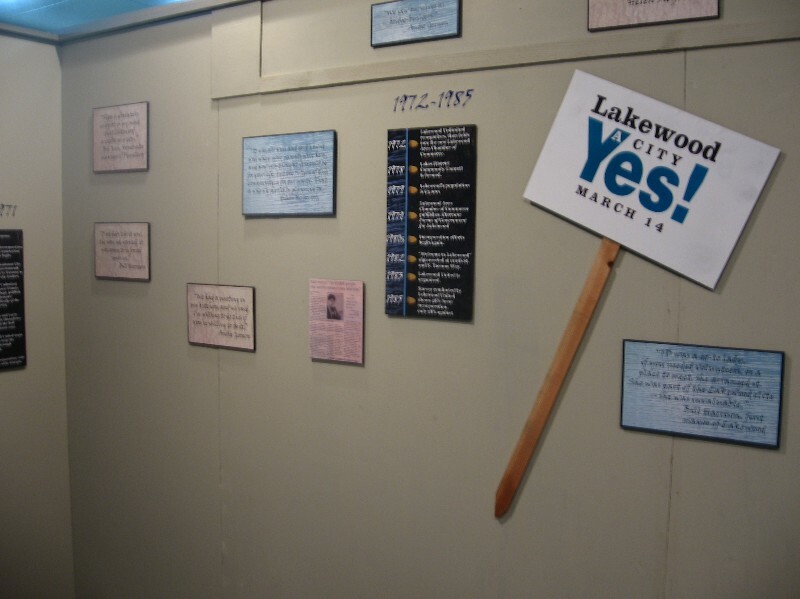 Oh, and my other gig, the Lakewood Cityhood exhibit, will be opening in two weeks. I have been creating graphics all week (well, taking the templates I created earlier and filling in the photos and text), and I’m just about ready to go to the printer tomorrow. Hallelujah. If you happen to be in Pierce County, Washington, on on Saturday, February 25th (or thereafter, until next February), come take a gander! It’s at the Lakewood History Museum. 1) Complete my first two freelance museum gigs. I did. Both well enough to get rehired [g]. 2) Find more potential clients and land more gigs. I found one more new client, which I’ve been working steadily for since April, plus, as I said, rehired by both my old clients, although one has since gone dormant till spring for lack of funds. 3) Go to more museum workshops and a conference, and continue Heritage League committee work. I’ve been to two workshops and taken two classes, but I didn’t make it to any conferences. The HL committee I was on finished its work in September, but I’ve been asked to be on the board, and probably will. 4) Write the mystery house rough draft. Well, no. I’ve been working on the Yellowstone trilogy, though, and I will get back to it after I’m done with it. 5) Revise Sojourn, last year’s NaNo book. Again, no, because of the Yellowstone trilogy. It’s in the pipeline, though. 6) Figure out what I’m going to do about the rest of the Yellowstone trilogy (which may end up as a duology), and get back to work on it. I did figure it out, and what I did was do one more edit on Repeating History, create a cover, and format it for Amazon and Smashwords. I self-published it in early August, and it’s been selling a steady trickle of copies ever since. And, no, the Yellowstone trilogy is not going to be a duology. True Gold, the second book, has an almost complete rough draft, and I have begun revisions. 7) Finish piecing the Imbolc Flame quilt, and finish quilting the Yule Log Cabin quilt. Maybe start a nice, simple throw of animal fabrics and the animal cross-stitch patterns I did last summer. The Imbolc Flame quilt is pieced. I haven’t layered it yet, but I’ll get there. The Yule Log Cabin, well… It’s the disaster I finally ended up giving away partly quilted. First time I’ve ever done that with a quilt. The throw has just started to materialize (sorry, bad pun). I started piecing on it last week. I’ve also created several quilted pillows and am almost finished quilting a baby quilt for the great-nibling due in April. 8) Find some good 6″ square flower cross-stitch patterns for my Beltane quilt and begin stitching them. I’ve stitched half a dozen of them, but I got sidetracked with some other projects, including a cross-stitched pillow. The Beltane quilt will happen. Eventually. 9) Go to Crater Lake, Yosemite, and WorldCon in Reno in August with my friend M.
We went, we had a great time [g]. 10) Do more research on Washington history — find some more good stuff for my writing. I did some, but I got kind of sidetracked researching True Gold. Weell… Regularly, but not nearly as often as I would have liked. 1) Complete the new museum exhibit by the end of February, and keep getting rehired to continue the textile collection work. 2) Pursue more collections work as opposed to exhibits work. Only sign with the dormant client if they have sufficient funds to finish what they hire me to do and a concrete objective for that work. Sign a contract with at least one new client. 3) Join the Heritage League board. Take a Photoshop class. Pursue other career educational opportunities including the Washington Museum Association conference, in Seattle this year. 4) Finish True Gold and self publish it by the first of June. 5) Write Finding Home (the third book in the Yellowstone trilogy) and self-publish it, hopefully by the end of the year. 6) Learn better book marketing skills and put them into practice. 7) Redecorate the living room. My living room has had a lighthouse theme for the last twenty years, and it’s time for a change. I have picked out some cross-stitch patterns and quilt fabrics with North American wild animals on them, so it’s a start. 8) Finish the baby quilt. Finish the animal sofa throw. Make a new table runner for the sofa table. Layer the Imbolc Flame quilt and start quilting it. 9) Make new cross-stitch pictures for the living room. I have eight picked out. We’ll see how many I can finish this year. 10) Make my first long car trip alone in five years [sigh]. The plan is to take off for two or three weeks in June and drive east. Maybe a night or two in Yellowstone to scatter bookmarks, but I want to go farther east than that, maybe as far as Theodore Roosevelt National Park in North Dakota. I also want to visit some of the historic sites like Fort Benton. 11) Get the garden cleaned up. So, what are your goals for 2012? Today is the day that all that work cataloging photographs for the Tacoma Historical Society pays off. Today, four virtual exhibits of historic photographs, one of postcards and photographs of early Tacoma schools, one of people, known and unknown, one of parks of Tacoma, and one of early Tacoma business and commerce, are available for public view on the Tacoma Historical Society’s website. Please go take a look, and tell me what you think! Rejections from agents or general trade editors is hardly ever a measure of the quality of your work. If you’ve gotten a lot of those, look at other ways of getting your work in front of readers. This makes me believe that the publishing world honestly is beginning to change. Speaking as someone who is finally getting up the courage to self-publish my books, that first sentence is the antithesis of what I’ve been internalizing for the last ten years or so. To read that in a “traditional” agent’s blog validates the route I’ve decided to take. Mind, I would have taken this route, anyway, as on a personal level I need more control over my career than traditional publishing would give me (which is also why I am a former librarian and currently an independent curator and exhibit designer in my other life), but it’s incredibly good to see this right now. Too long, I’m afraid. I’m about to finish my second gig (the photo curation for the Tacoma Historical Society). I have finished curating and cataloging over 2200 images, ranging from glass negatives to prints from digital images, and am now in the process of building virtual exhibits, collections of photographs with informative captions, which will be placed online as part of the Society’s website. I will post the link as soon as it becomes available. The first two virtual exhibits will be about early Tacoma schools and historic personages of Tacoma, respectively. I have started a third, curating textiles, beginning with a collection of wedding gowns running the gamut from late 19th century to almost modern, for the Fife Historical Society. And I am in discussions with yet another local historical society for the creation of another exhibit this fall. So the freelance museum curator business seems to be keeping me in cotton gloves and acid-free tissue, at any rate. One other piece of unrelated news: I am in the process of editing, creating cover art, and formatting my historical with a whiff of fantasy novel for the Kindle and Smashwords. I hope to have it up and for sale by the end of July, and I will announce it here (and everywhere else I can think of) as soon as it becomes available. And I’ll try not to disappear into the ether on you again any time soon, too.